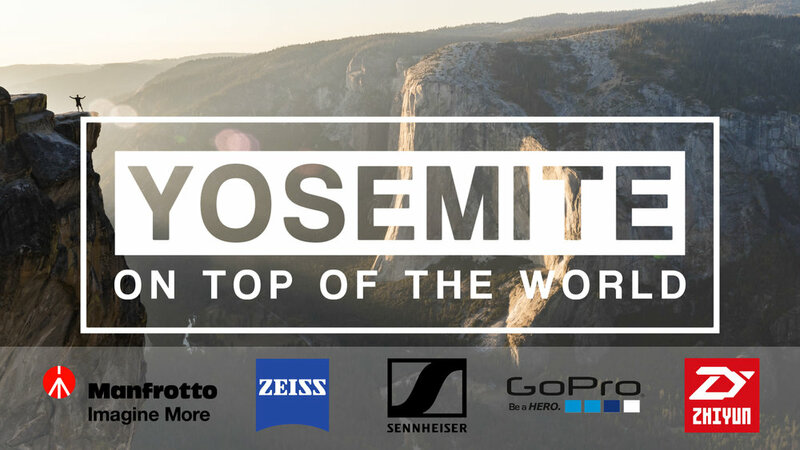 ‘YOSEMITE On Top Of The World’ is a collaborative film and photography project between APVideo and the leading global brands in media acquisition; ZEISS, Manfrotto, Sennheizer, GoPro and Zhiyun-Tech. In October 2018, APVideo embarked on an adventure to capture the beauty of Yosemite National Park, the changing of the seasons, and to demonstrate filmmaking and photography techniques while hiking and travelling. What Equipment Did We Choose For The Adventure? Choosing the right equipment was paramount, not only for image quality and the storytelling aspects. All of the kit had to fit into one backpack, that would be carried for the 6 days in Yosemite. That meant it needed to be light, but also perform in the drastic changing conditions in Yosemite Valley and the surrounding mountainous landscapes. We use the Sony a7SII and Sony a6500 mirrorless cameras for filming and photography on a regular basis. The tiny bodies, low light capabilities and higher megapixel count on the a6500 made them the ideal tools for the job. But what about the rest? We were privileged in using the brand new ZEISS Batis 2/40 CF lens on this trip, as well as the 2.8/18 and 1.8/85 lenses. Across the full frame a7SII and APS-C a6500, we had a varied choice in focal lenghts and possible angle of views. The Befree Live CF is the ideal tripod for travelling. It folds up to a tiny size (great for flying and hiking), and has a fluid head capable of smooth pan and tilts. For filming and photography with mirrorless cameras, it’s a lightweight partnership. The Sennheiser Memory Mic is an ideal mobile journalism voice recording device, and the Ambeo Smart Headset gave us the capability of capturing 360 degree sound. The GoPro Fusion allowed us to capture the beauty of Yosemite from a completely new perspective, in 360 degree photo and video! This will be combined with the Ambeo Smart Headset audio in post. Allowing us to capture movement, both subtle and grand, the Zhiyun-Tech Crane Plus is a very small hand held gimbal, ideal for keeping your camera setup compact and efficient. Keep following this thread as we upload more of the ‘YOSEMITE On Top Of The World’ story and share many of the photos and videos we captured along the way.